At 3am on Monday January 7th, Ahmad Sider was born in the street ten metres from an Israeli checkpoint in Hebron, after Israeli soldiers prevented his mother from passing for 25 minutes. She went into labour during the night and shortly before 3am attempted to pass the checkpoint with her husband. They live in Tel Rumeida, in H2, the area of Hebron controlled by Israel under the Hebron protocols. To reach the hospital they must pass the checkpoint on foot and meet an ambulance on the other side, as Palestinians are not permitted to drive in H2. The soldiers manning the checkpoint refused to let the couple pass, although his mother, Kifah (whose name means 'struggle’), was screaming and pleading with the soldiers to open the checkpoint, telling them she was about to give birth. They continued to refuse, saying they required permission from their commander, even though there was no curfew in place and this checkpoint is supposedly open 24 hours a day. Kifah and her husband were finally allowed to pass 25 minutes later. However, just ten metres beyond the checkpoint, she collapsed on the street in pain. 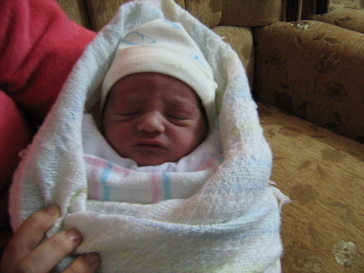 Residents of a nearby house brought out a mattress and Ahmad was born on the street in below-zero temperatures. His father wrapped him in his jacket and within a few minutes a Palestinian ambulance took mother and child to the hospital. Thankfully Kifah and Ahmad are now both safe and well.